solutions for Global 2000 companies. 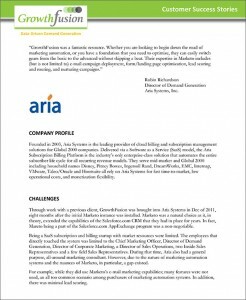 GrowthFusion helped Aria with Several demand gen initatives including Lead nurturing, Lead Scoring, Lead Routing and Reporting. YouSendIt is the leading provider of extended enterprise collaboration services with over 600,000 paid subscribers in 193 countries across 98 percent of the Fortune 500. 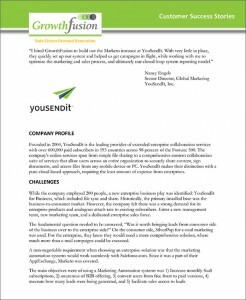 At the very initial stages of setting up the enterprise team, YouSendIt brought on GrowthFusion’s principal to help with setting up the demand gen infrastructure (including Lead Scoring and Lead Nurturing) and Campaign Execution.